As we prepare for the launch of Rodan + Fields in Canada, this 25 minute recorded webinar will walk you through business basics and frequently asked questions about conducting business is Canada. Go to https://www.rodanandfields.com/ca/ then enter my name (Anita Leonard) or my consultant ID (780648) and click Search to enroll. Who will be the first Million Dollar Earner in Canada?! It could be you! Categories: Canada Launch, Rodan + Fields Skincare | Tags: anita, business, canada, care, dermatologist, direct, doctor, dr, enroll, feb, february, fields, hermitage, join, launch, leonard, marketing, nashville, network, presentation, questions, rodan, sales, selling, skin, skincare, tennessee, tn, video, youtube | Permalink. 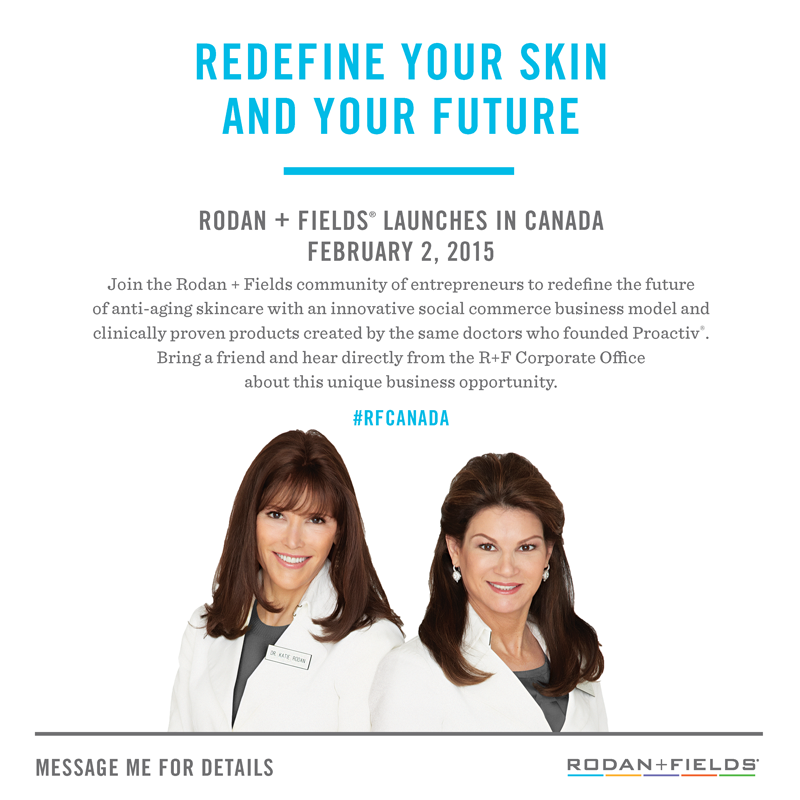 We have an official launch date for Rodan + Fields® Canada! On February 2, 2015, all Rodan + Fields Consultants with an active Consultant Agreement will be able to begin conducting business in Canada. This means that Consultants will be able to sell products from the Canadian catalog to all customer classes, enroll Preferred Customers, sponsor new Consultants within all the geographic regions in which Rodan + Fields is registered to conduct business* and be compensated under the Rodan + Fields global compensation plan. *Consultants may be enrolled in, and sponsor other Consultants in, all provinces and territories in Canada, with the exception of Quebec. The selling of products to Retail and Preferred Customers is permitted in all provinces and territories in Canada, however in the Province of Quebec residents must enroll as Retail or Preferred Customers by their own volition on our Corporate website. Categories: Canada Launch, Rodan + Fields Skincare | Tags: anita, canada, enroll, enrollment, fields, hermitage, leonard, nashville, pre-enrollment, register, rodan, sign up, tennessee, tn | Permalink. Categories: Canada Launch, Rodan + Fields Skincare | Tags: anita, canada, canadian, consultant, direct, enroll, enrollment, fields, hermitage, leonard, marketing, meeting, mlm, nashville, network, nov, november, pre-enroll, pre-enrollment, rodan, selling, tennessee, tn | Permalink. Rodan + Fields kicked off August with five events in Victoria, Vancouver, Winnipeg, Toronto, and Calgary and have a great line up for October. Join them at these limited engagement preview events. Be among the first in Canada to hear what’s possible when you combine the biggest names in skincare, an innovative business model and products clinically proven to reduce the signs of aging. Categories: Canada Launch, Rodan + Fields Skincare | Tags: anita, beauty, business, canada, canadian, care, direct, fields, hermitage, launch, leonard, marketing, nashville, network, rodan, selling, skin, skincare, tennessee, tn | Permalink. Rodan + Fields schedules Canada launch for Feb 2, 2015!! The new website is up and running!! rodanandfields.com/ca provides information about the Canadian launch, including the products, community, and company – what makes R+F unique. Categories: Canada Launch, Rodan + Fields Skincare | Tags: anita, business, canada, fields, launch, leonard, rodan, skincare | Permalink.